Marc Hynes believes he can challenge at the front when he returns to racing in the British Touring Car Championship next season. The 1999 British Formula 3 champion and Marussia Formula 1 team head of driver development announced on Wednesday that he will race a third Triple Eight-run MG6 in the BTCC in 2014. Hynes made his testing debut in the car at Brands Hatch on Thursday. He believes he can be successful alongside double champion Jason Plato. "There are a lot more downs than ups in general in racing so you need to go with people you can believe in," said Hynes, whose only front-wheel-drive experience came in a Renault Laguna BTCC test in 1997. "Jason's proved the car's a championship contender and can win races. "If we want to do it, we want to be successful. It makes life a lot easier if you've got the best kit straightaway." Although Hynes will continue in his role at Marussia, he ultimately wants to challenge for the BTCC title. "I'm fully committed to do the F1 and GP3 job with Marussia and Manor," added Hynes. 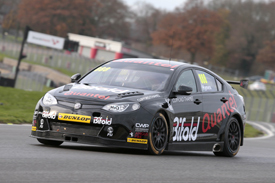 "The BTCC is only 10 weekends and there's not much testing, so it can work. "The getting on the pace bit, I'm sure I won't be too far off. For the racing, you need the experience of the door-bashing and the weight and the backwards and forwards on the grid. "I'm treating this as a bloody serious hobby rather than a career. "I've won Vauxhall Junior, Formula Renault and Formula 3 in the UK, so I'd expect to do well, even though I realise it's a completely different arena, driving against guys who've been doing this for decades and are bloody good at what they do. "In future, who knows? I want to win the BTCC. I don't know how long it might take. I will be taking it incredibly seriously, as I always have done when I've gone racing."